The dawn following the desperate and bloody battle along the Weissbach was pleasing to Prinz Schwarzenburg. Ney, it seemed, had abandoned the field retiring northwest. Could this be the beginning of Napoleon’s defeat? 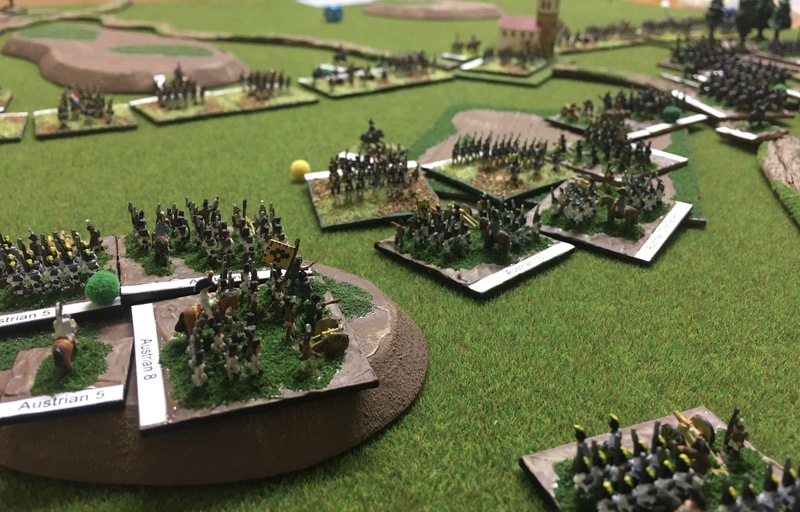 Schwarzenburg ordered an immediate advance and the Austrian regiments moved forward in pursuit, the white clad ranks of Austria moved forward confident in their cause. By noon however the French forces were located around two miles east of the important town of Kutzenberg. Ney had formed a new line northwest of the Weissbach. In the centre Schwarzenburg deployed Colloredo’s 1st Korps, some three divisions, all veterans of the previous days fighting. The 2nd and 3rd Divisions, comprising infantry, formed the centre with four regiments deployed on two seperate hills while other regiments deployed in support. The 1st Division, a mix of Grenz and Hussars, covered the left. To the right the Austrians were supported by the Prussian 2nd Corps, commanded by von Kleist. This corps deployed a further three divisions, of which two were infantry while the third comprised cavalry. Above, Colloredo’s 1st Korps. On the left is Hardegg’s 3rd Division and on the right Greth’s 2nd Division. In the distance is Wimpfen’s 1st Division. With the French opposite having a considerable numeric advantage. Prinz Schwarzenburg now focussed his attention on deploying more of his advancing Austrians into position, particularly Klenau’s 4th Korps and elements of the Austrian Reserve before the expected French attack could fall. Unlike the Allies, with two corps deployed, Ney was concentrated and had three corps in position. On the French right Marmont’s VI Corps was well positioned despite it’s retreat from the Weissbach. In the centre was Lauriston’s V Corps, reinforced by a division of Young Guard. Of all the French corps on the field this was the largest. Finally, on the French left, and therefore opposite the Prussians, Reynier deployed elements of VII Corps, reinforced by a division of Westphalians. Two situations perplexed Schwarzenburg. His left was lightly held and it would be another hour before Klenau’s 4th Korps would arrive on the field. Another two hours would likely pass before it would be fully deployed. During this time the Austrian left could be hard pressed. However, of more immediate concern was the right. 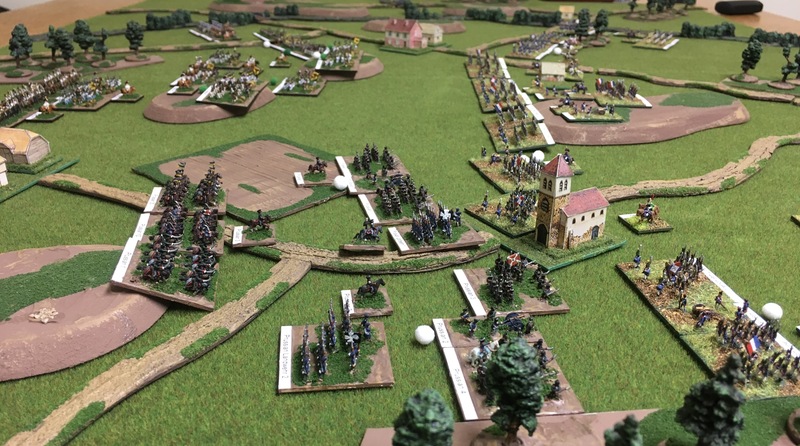 The redoubtable von Kleist was clearly spoiling for a fight and had advanced his corps forward towards the town of Geisig. This resulted in a gap between the Prussians and Austrian centre which could be exploited. Ney, around 2.30pm ordered forward Reynier’s VII Corps. 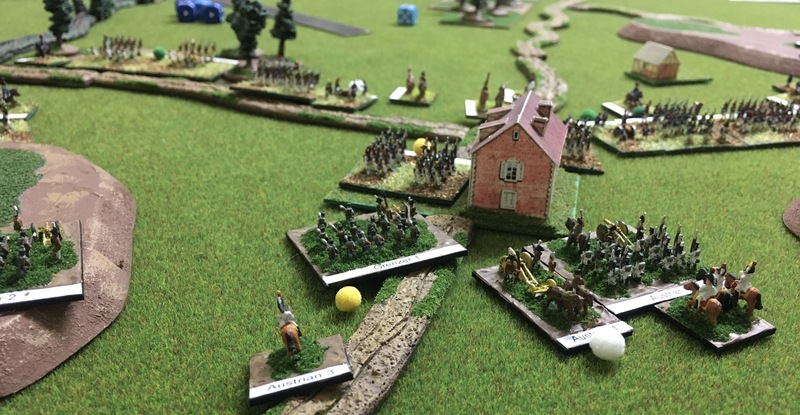 While Gruyer’s Brigade secured the town of Geisig other brigades from the 13th and 32nd Divisions moved further to the French left no doubt to counter any Prussian flanking movements. Meanwhile on the French right and centre, the various divisions of Marmont’s VI Corps and Lauriston’s V Corps moved forward. Progressively French batteries would deploy and over the next couple of hours a series of ineffectual bombardments of the Austrian centre would occur. The battle now focussed on the Allied right where von Kleist at 3pm launched his Prussians forward in a dramatic attack on the town of Geisig. No less than three regiments drawn from the 9th and 10th Divisions were thrown into this attack. While two regiments were well drilled, one comprised Silesian Landwehr and its early commitment indicated the resolve of von Kleist to seize the initiative and the town. 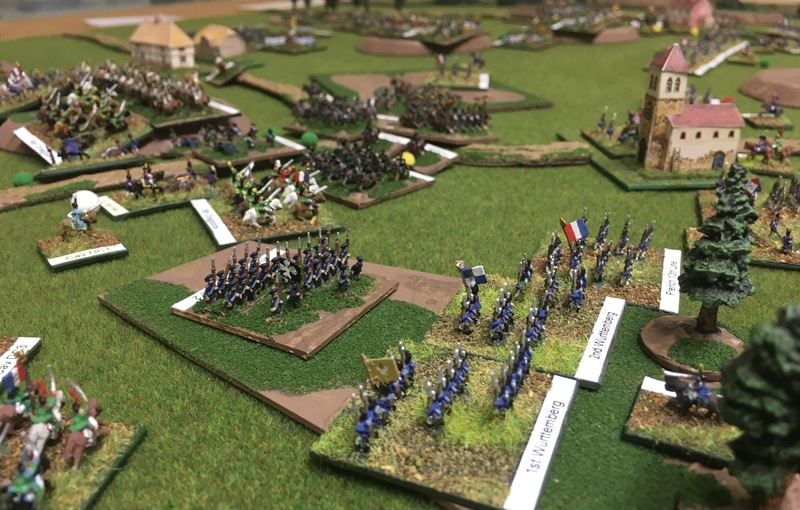 Despite being heavily outnumbered the French fought with determination and the Prussians were forced back with the Silesian Landwehr in full rout. 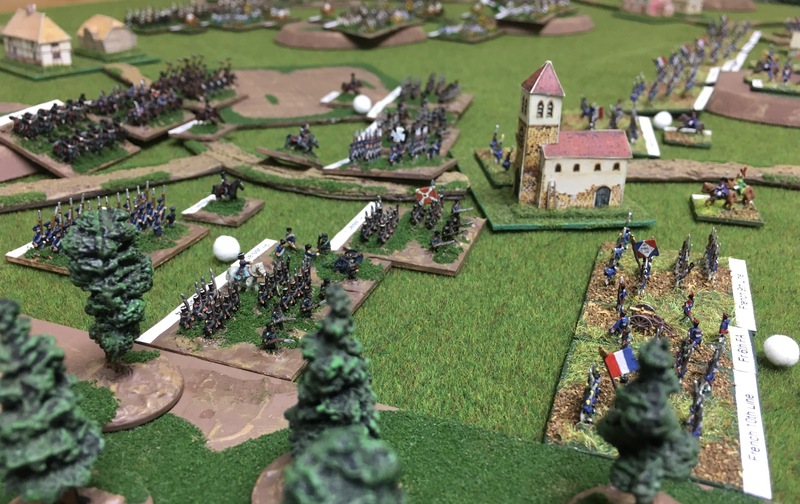 Above and below the Prussians attack the French in Geisig. The central of the three Prussian regiments is the Silesian Landwehr of von Klux’s 9th Brigade. The Prussian 2nd Corps Cavalry Reserve, some 3000 men under von Thielmann, can be seen in the left, in reserve. While the attack on Geisig had failed Schwarzenburg took heart as the Austrian Reserve deployed in the centre. The Converged Grenadier Division of Bianchi and three cavalry brigades from Klebelsberg’s Division would soon become a critical reserve plugging the gap between the Austrian centre and Prussians. Below, the Austrian Reserve moves forward and will soon deploy to the right. Unlike the French left the French right seemed less aggressive. Colloredo fearful of an attack on his left, before 4th Korps had arrived, hoped to secure his left by securing the town of Hauberg. As a result one of the Grenz Regiments from 1st Division moved forward to seize the town. 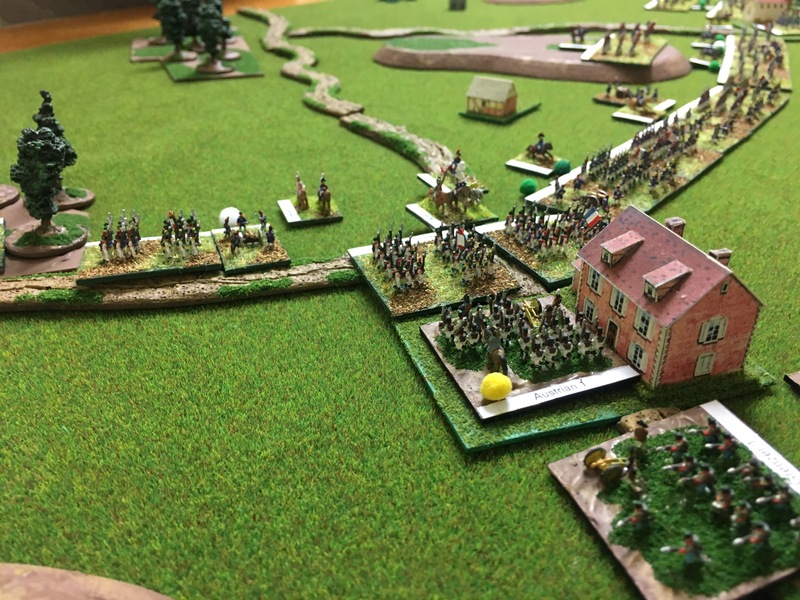 This of course resulted in a counter attack by the French. No sooner had the Grenzers deployed than two French brigades advanced. While fighting desperately the Grenzers were ejected. Acting quickly Schwarzenburg ordered three additional regiments forward. An additional Grenz Regiment as well as two regiments advanced under Schwarzenburg personal direction driving the French from Hauberg. Before the Austrians could consolidate their hold on Hauberg another French attack was launched resulting in more confused, but desperate, fighting. Yet again the Austrians were forced back. Undeterred Schwarzenburg ordered more regiments of the Austrian left flank forward, now supported by horse artillery. Again the French fell back unable to withstand Austrian determination. Below, Deutsch-Banet Grenz and Froon’s infantry regiment attack Hauberg. Now, unwilling to contest Austrian resolve, the French attacks against Hauberg ceased. Colloredo, finally reinforced by elements of 4th Korps, slowly increased the pressure on the French left. First by massing his artillery and later, as dusk approached by attacks launched from Hauberg itself, such as the one below, by the Deutsch-Banet Grenz. 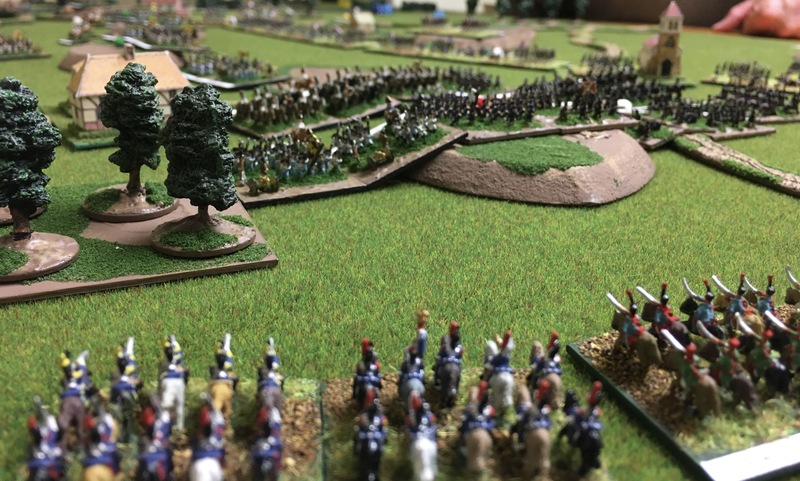 However, Schwarzenburg had faced serious problem on his right for much of the afternoon where no fewer than four French cavalry divisions, from the reinforced II Cavalry Corps advanced against the Prussian right in the early afternoon. Here the French cavalry commanded by Sebastiani comprised a total of 4000 light cavalry, 2000 Dragoons and a further 2000 Cuirassiers in four divisions. 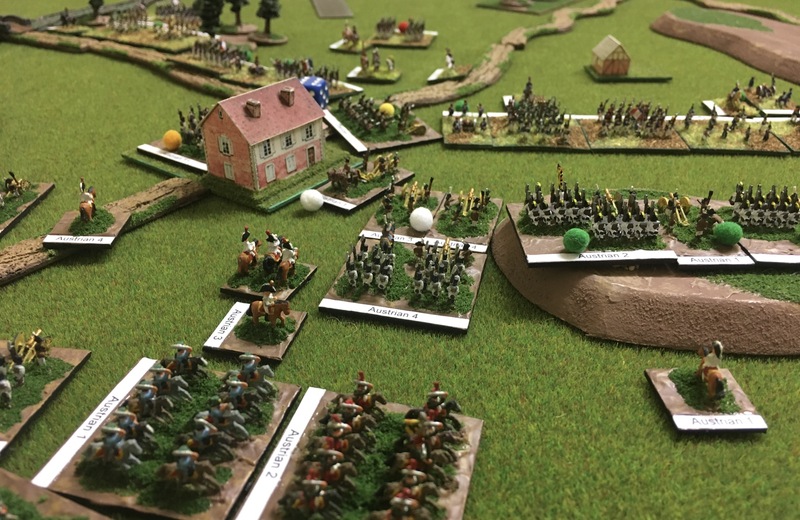 Above, the French cavalry as it arrives on the battlefield and below the general situation. Below, the Prussians an hour later, now supported by Austrian Grenadiers, and realigned to face the French cavalry. Around 4.30pm, supported by various horse artillery batteries the French cavalry surged forward. 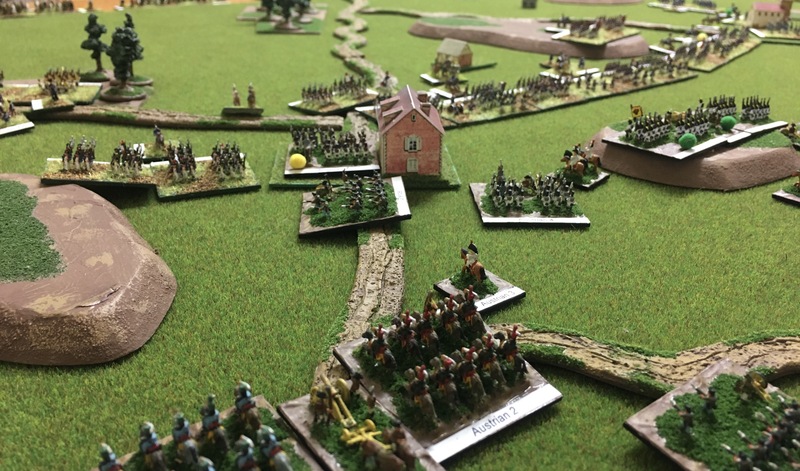 Simultaneously Decouz’s Young Guard advanced against the Prussian left flank. The hastily formed Prussian line generally held and where some brigades broke the gaps were in turn filled by Prussian cavalry, Austrian reserve infantry or Austrian cavalry in a dynamic battle that lasted for two hours. Casualties were heavy with several divisions, of both armies, exhausted by the unceasing attacks and counter-attacks. Above, a gap is created in the Prussian line. Soon another Prussian regiment would retreat. 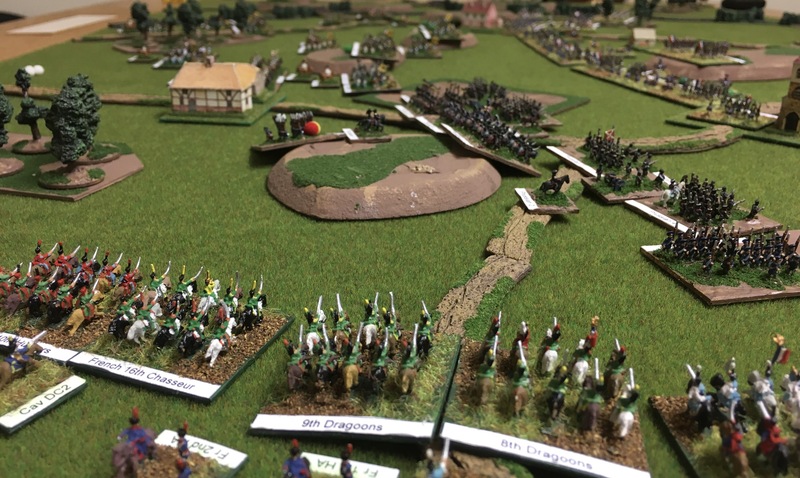 Below, Austrians launch a counterattack against Decouz’s now isolated Young Guard. 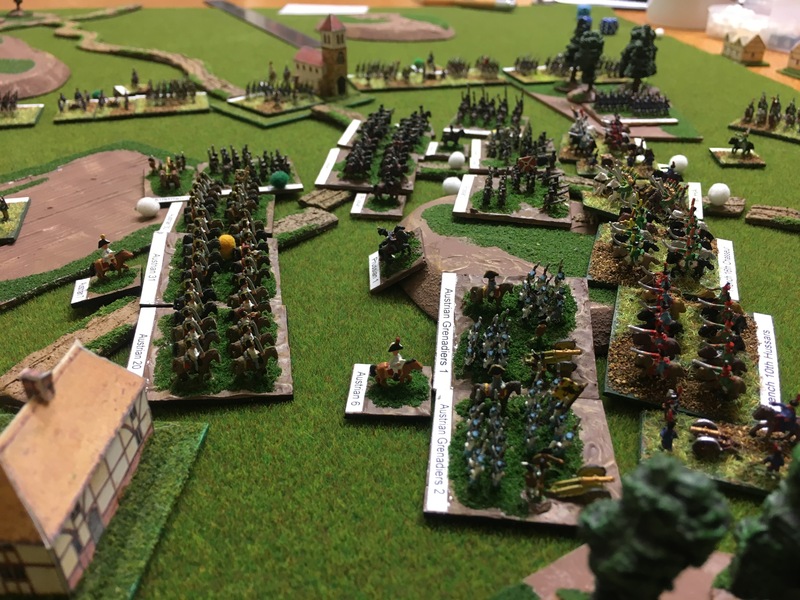 Below, Prussian Landwehr engage in a musketry exchange on the Allied right against two brigades of Württembergers. The battle had again been developed using the Road to Glory system with both armies comprising 4000 points of troops. The Allied players, of which there were two, had selected Build-Up Echelon Right #10 while the French player selected Turning Maneuver Left #21 and therefore had the burden of attack. All figures are from Heroics & Ros 6mm range. The Allies are from my own collection while Jon provided the French. 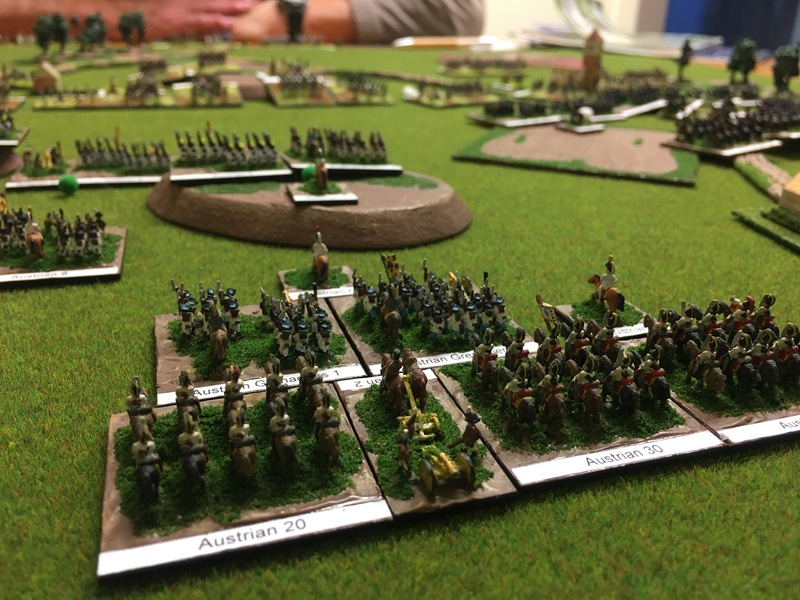 15mm Napoleonics look so great on the full-sized 3″ stands. Lovely looking game. Thanks Allan, but these are actually 6mm Napoleonics on half scale bases. 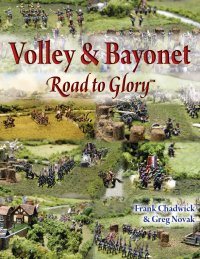 For those not familiar with Volley & Bayonet 1″ represents 100 yards and massed bases are normally 3″ square. At half scale the ground scale is 1″ equals 200 yards and a massed base is 1.5″ square. The time scale remains unchanged, that is one complete turn, comprised of two player phase, represents one hour. 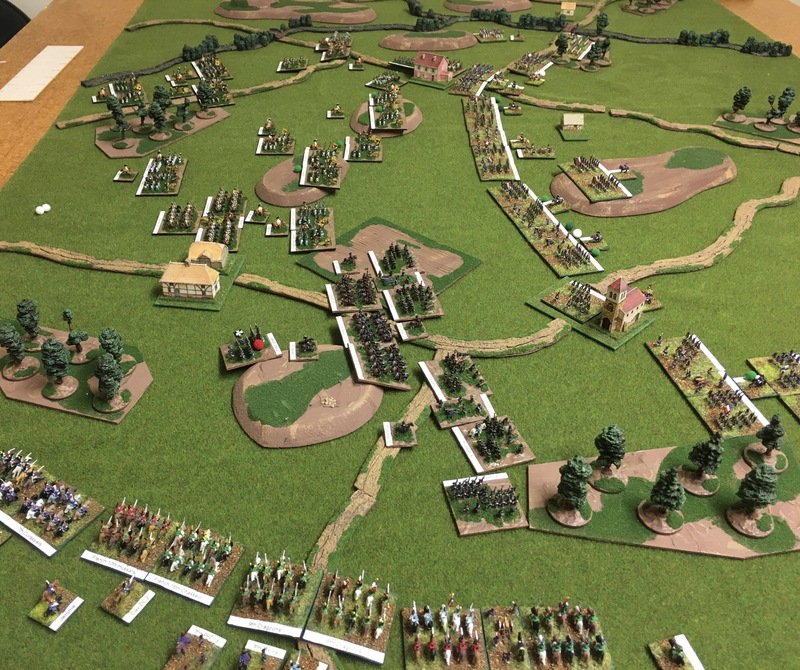 We use half scale so we can refight large historical battles on a reasonable sized playing area. Another great report, cheers Keith! Thanks for your feedback Mark. I’m pleased it was interesting.